In The Eyes Of The Beholder: An Award From Mistina... Thanks! An Award From Mistina... Thanks! Mistina, a newbie in the blogsphere, passed on an award to me! That's sweet of you girl! 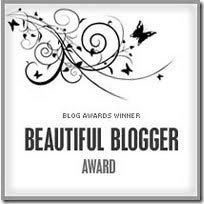 Thanks for recognizing me as a "Beautiful Blogger". Makes me blush! LOL! Mistina's blog is an orange blog! :D I think that's her favorite color! Haha! Isn't it obvious? Geez! I'm making a fool of myself! Peace out to you, Mistina! She's a Filipino/American girl who I think grew up overseas because she doesn't understand Tagalog nor Cebuano. We hope to get to know you more as you continue to share your life here in the blogsphere! Keep it up girl! 1. I sing and play the guitar which I seldom do nowadays because of my very busy schedule. Phew! 2. I like sweet corn kernel. That's my fave snack. 4. I am straightforward sometimes especially if someone is annoying. :D This tactless me gets me in trouble sometimes. 6. I get drunk easily so I choose not to drink alcohol. 7. I love watching movies. I'm not so good about tagging. I'm sorry. Anyone can grab this award though!